Other Ludwig jr drum set reviews tell you about how famous Ludwig is as a drum brand and how Ludwig used to be endorsed by Beatles drummer Ringo Star in the late 1960s. But we’re talking about the much cheaper Ludwig junior drum set here, and the quality of Ringo’s set hardly has any bearing on the quality of Ludwig’s junior kits. So I’ll rather answer the most frequently asked questions from around the web. And I’ll tell you what’s really important when looking for a drum set for your child. By the way: the Ludwig junior drum set is also sometimes called “Ludwig LJR106” or “Ludwig junior outfit drum set”. These terms refer to the exact same set that you’ll learn about here. 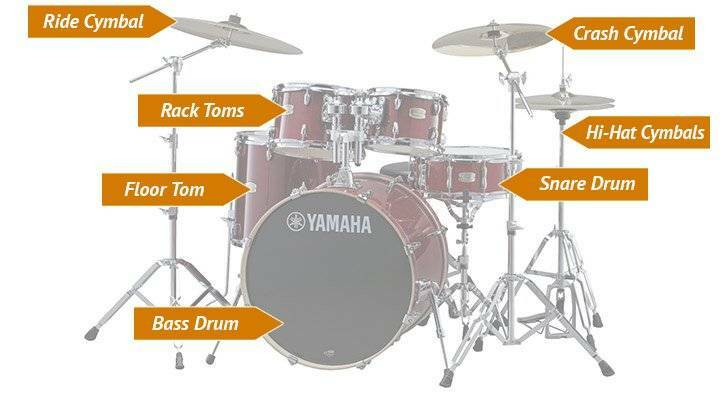 What’s important when looking for a junior drum set? Setup, or: will your child learn the right motions? This is a junior drum kit, so the bass drum is smaller (16”) and the bars of throne and snare stand are shorter than they would be on an adult drum set. These are the only three parameters that really influence who can use that set. And they dictate that your child should not be taller than 5ft. Otherwise he/she will sit much higher than the snare drum is, and that will be uncomfortable. If this applies to your junior drummer, he/she should look for adult sets, and you can check out my best beginner drum set review. 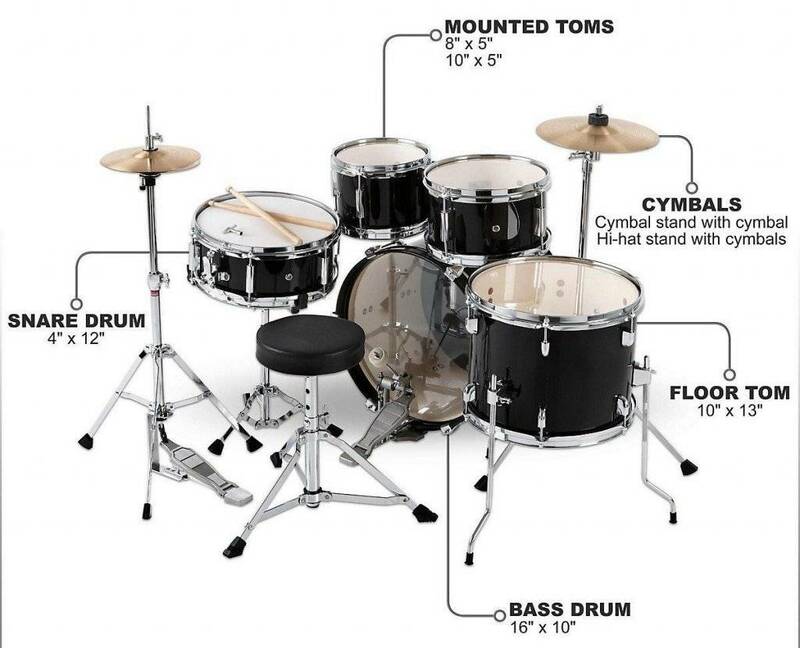 Also this kit is not for your child if he/she is shorter than 3ft, because then they will have to stretch and strain to reach for the bass drum pedal. Uncool! Inside the box are the drum shells, cymbals, the seat and all the hardware and screws you need in the smaller boxes. “Hi-hat stand with cymbals” should be on the left-hand side. That’s where the Hi-hat is. Sorry for that! As you can see: the Ludwig jr drum set comes with all the hardware you need, even with a simple bass drum pedal and with two cymbals: a Hi-hat (left) and a Ride/Crash (right). You’d also get a drum key (needed for assembly) and a pair of simple sticks right in the box. So your child can start to play right away. Finally, the kit also “comes with” a 1 year warranty against manufacturer’s defects. 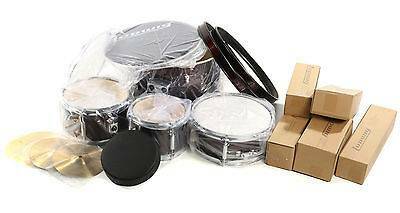 So now that you know what’s in the box, we’ll look at the 4 most important criteria for a junior drum set: color, sound, setup, and durability. Color shouldn’t be underestimated. I’ve seen one female student of mine significantly improved after her parents exchanged the blue for a red set. So please ask you child for his/her opinion on the color. 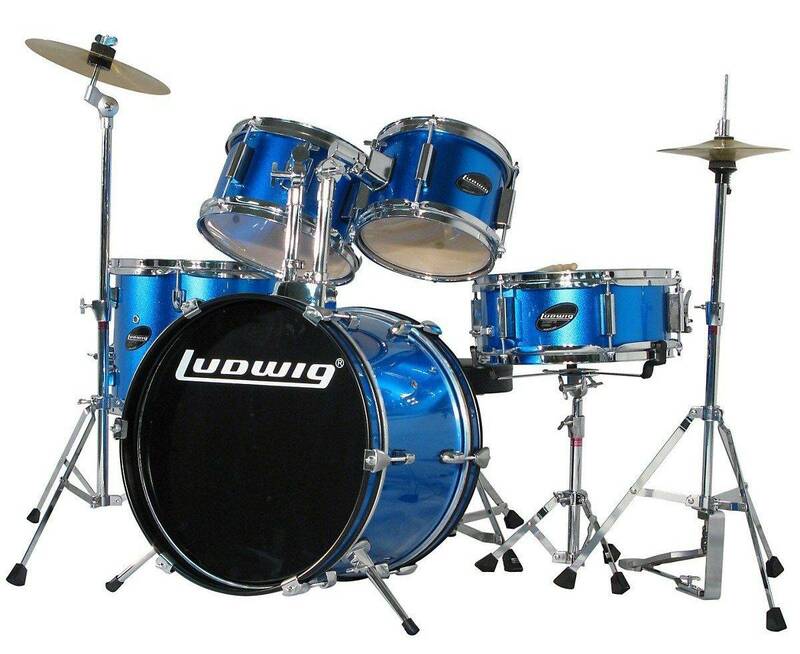 The Ludwig jr drum set comes in three color options: blue, black and wine red. If your child wants more options to choose from, the Mendini junior drum set gives you 7. Still, the drum set shouldn’t sound all too crappy, and the good news is: any set can be made to sound fairly good with the help of some tape and the right tuning (which you can learn fairly quickly here). Because the sound depends more on the heads than on the drum shells themselves. To my mind, this sound is quite okay. The only thing that’s annoying me is the bass drum. Its head seems to be too tight and I suspect there’s no pillow/blanket inside (makes the sound more dry and punchy). So, I’m happy with the sound potential (again, much depends on tuning). What do you think? One thing can’t be denied: the cymbals sound crappy. They sound better than the ones coming with a Mendini or Gammon junior drum set as they are less flimsy. But the sound still isn’t what I’d consider nice. That’s not good, but it’s the same with all other drum sets for kids. In truth, it’s even the same with advanced adult drum sets. But as I said, there still is the kids-don’t-care-as-much-about-sound point. Most of my students were completely fine with the cymbals for a long time. Short answer: yes. You shouldn’t expect high-quality work, but all the rods and screws are made of simple yet durable aluminium. Especially the snare stand and the throne are more sturdy than the ones by Gammon or Mendini, which have been reported to break in some cases. Setup is crucial, because your child will switch to an adult set at some point, and this will most likely be set up the standard way. So if he/she plays on a set that has a different setup for the first few years, all these different/wrong motions will become internalised. And it’s hard to forget muscle memory. So here the Ludwig has one advantage over the Mendini and Gammon junior drum sets on which the cymbal is positioned right in the middle and not on the right (from behind the set) where it should be. Yes, there are loads of parts in the box. And yes, the instructions coming with the Ludwig jr drum set are poor. But that doesn’t mean assembling it is all too difficult. Once you see it demonstrated, it will be pretty easy and only take around an hour. Once the kit is up and running, it takes up a space of about 3ft x 4ft. All in all, the Ludwig jr drum set is a good first kit for a child. The sound is fairly similar to other junior drum sets, since so much depends on tuning. But the cymbals are slightly “better” (but still low quality), the Ludwig jr has better hardware and, most importantly, a setup that’s will enable your child to learn the right motions. 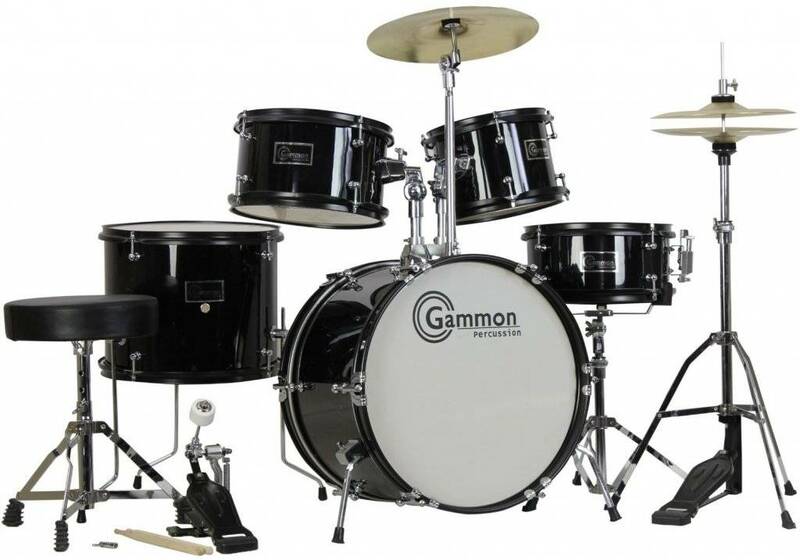 The only real disadvantage of the Ludwig jr drum set is that it’s considerably more expensive than Mendini and Gammon. So, if you manage to cut a deal on a used Ludwig junior drum set on eBay (button below), I’d recommend going for it. Otherwise, I’d look into cheaper junior drum sets and save the money or invest it in new heads or cymbals. If this review was helpful to you and if you decide to buy a Ludwig junior drum set for your child, please consider going through one of links / buttons above. This way I’d receive a commission at absolutely no extra cost to you, and you’d reward me for the care and effort I put into each of these reviews. If you want to know more about my reviewing ethics, that’s right here in my affiliate disclosure. Thanks so much for your reviews and all the info! So very helpful! Have you heard of or maybe even tested the brands: Ashton or DXP? They seem to be available in Australia. Thanks! Unfortunately, I haven’t, Emma. I suggest you try to find out what you can from the user reviews. Hope that helps at least a little bit!